Service dogs are a lot of things to their partners: companions, helpers, independence helpers, and family. All service dogs start out as puppies, and many are able to help someone gain their independence through a lifetime of training. A donation of a puppy can help these individuals obtain independence that they’ve never experienced before. Domesti-PUPS focuses on using dogs for mobility assistance, wheelchair assistance, hearing and medical alert or response dogs. Many dogs that come from a history of confident, calm, focused, working dogs that receive the correct handling, social, and environmental stimulation in the first weeks of their lives have the best chances of becoming service dogs. 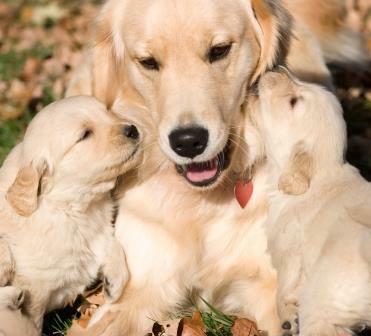 Retrievers and retriever mixes are very common in Domesti-PUPS, due to their general size, willingness to please, training motivation, and ability to carry things in their mouths. However, we are always willing to look at different breeds of dogs, as long as the parents meet some of the qualities that have proven to produce good service dogs. Whenever possible, Domesti-PUPS prefers to temperament test the entire litter of puppies, to find which one is the most suitable in the qualities we look for in future service dogs. However, if the breeder is located very far away, we can send the temperament test there, for the breeder to administer and send the results to us. Very few dogs actually become service dogs, due to the high levels of training, and the consistency needed to become a service dog. Puppies/dogs that do not make it through the service dog program at Domesti-PUPS may be used in another program, such as our Edu-PUPS or Petting-PUPS program, or possibly placed in a permanent pet home. We understand the dedication and commitment breeders have to the puppies they raise, and the futures they hold. This is why Domesti-PUPS understands that requesting a donation of a puppy is a huge favor to ask, but one that is required in order to have a successful service dog in the future. Please consider donating a puppy to Domesti-PUPS, to help us unlock the independence of a person in the future. If interested in donating a well-bred, and well-raised puppy to Domesti-PUPS, now or in the future, please contact us at info@domesti-pups.org. Thank you for your consideration.